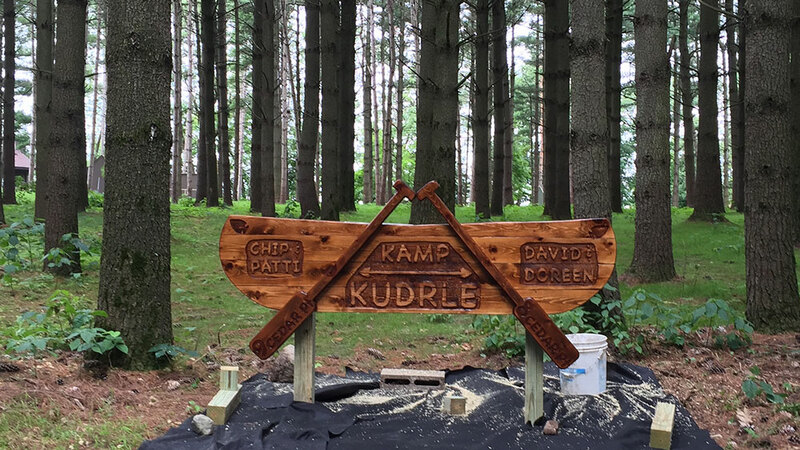 Chip and Patti Kudrle found a cabin only 52 minutes away from their home. 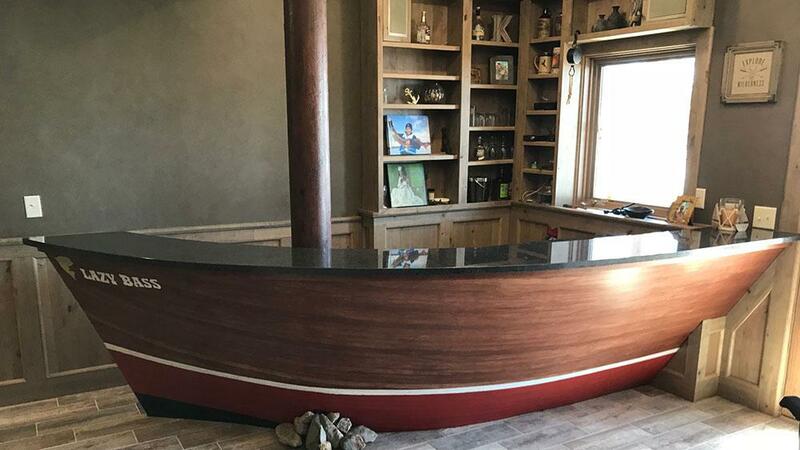 Here, they have made a cabin with fun boat decor and even a boat bar! 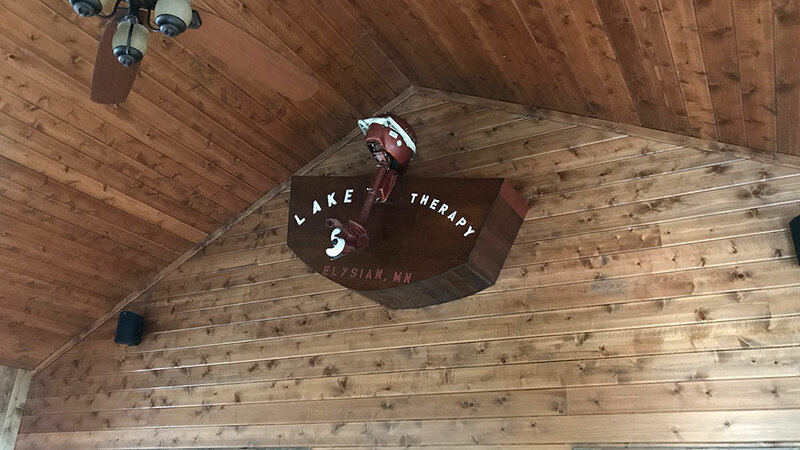 For many years my wife, kids and I would make the trek to our cabin in northern Minnesota. Unfortunately the 3-1/2 hour drive was getting to be too much. We discovered Lake Francis, in Elysian, Minnesota back in 2003. 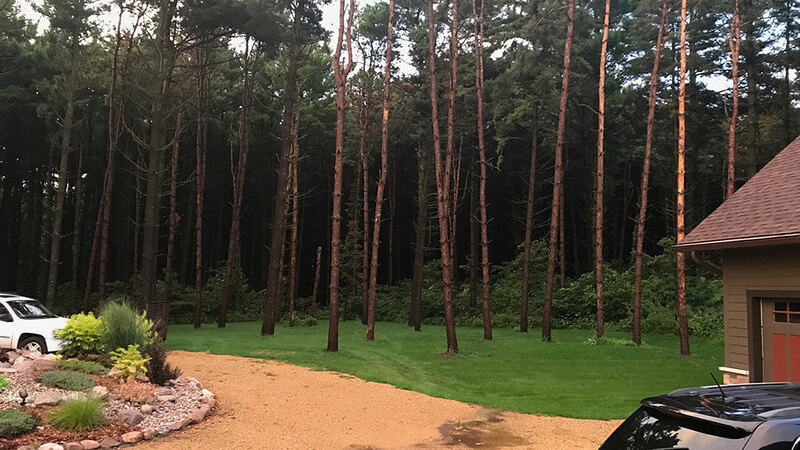 The lot was a 60-feet deep, 950 acre lake in southern Minnesota that is very clean, spring fed, and even better—52 minutes from home. 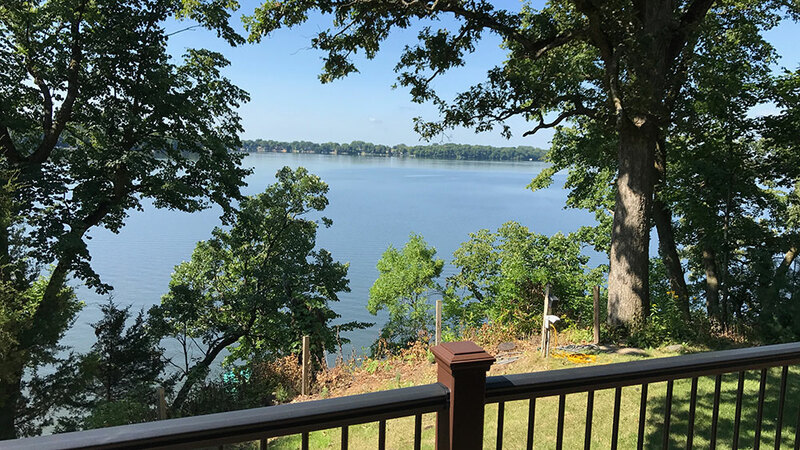 Timing is everything, and 21 acres on the north side of the lake went on the market. 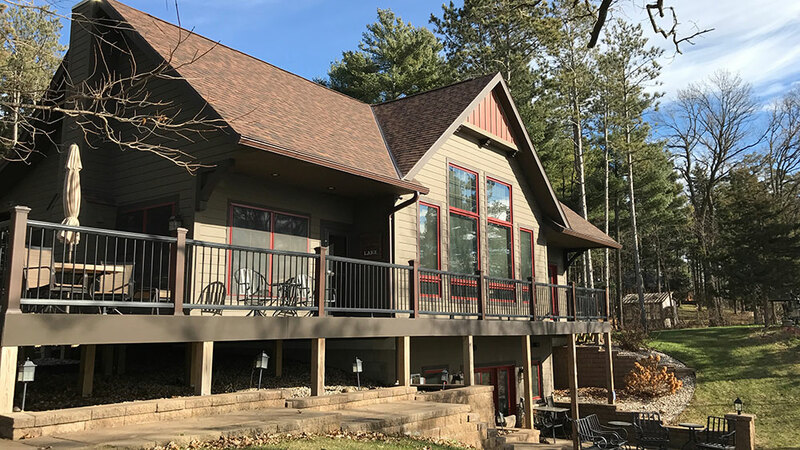 This property features towering white pine, norway pine, spruce and spindly red cedar on the ridge by the lake. We purchased a 7-acre parcel (My brother, Dave, and his wife, Doreen, purchased 7-acres next door). We had plenty of time to plan out the house, we knew what we valued because we owned a cabin before. 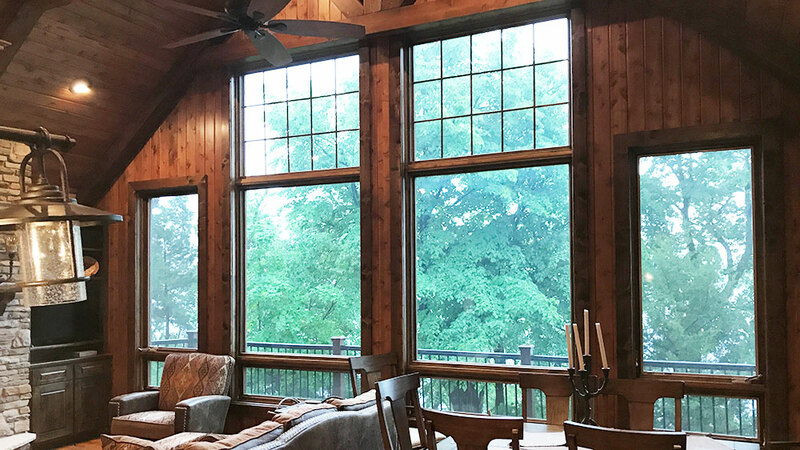 When you walk in the front door you are greeted by a vaulted great room with an immense wall of glass providing a panoramic view of the lake from our perch 50 steps above the lake. 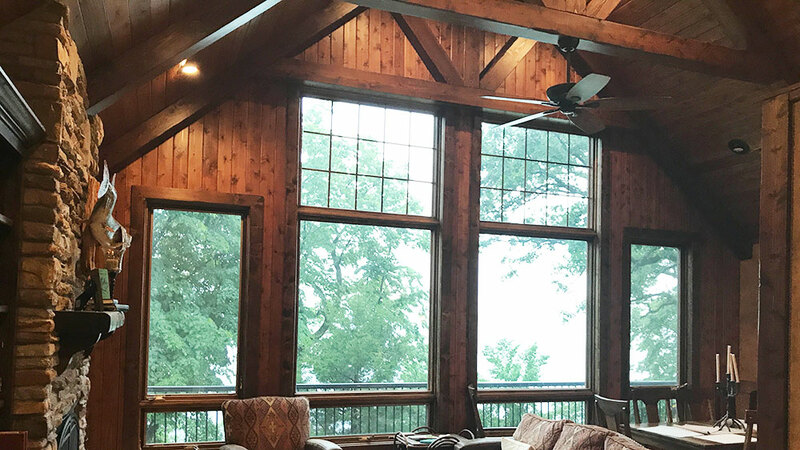 The great room, dining room and kitchen all enjoy these views of the lake and great views overhead of some intricate beam-work. 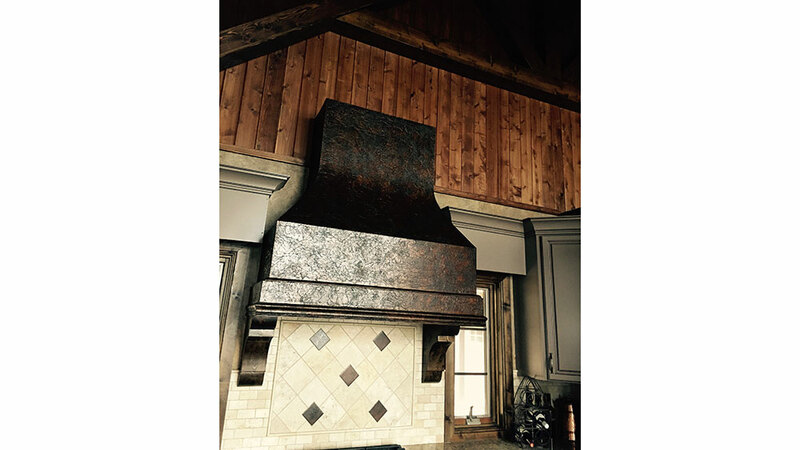 The kitchen has custom cabinets and a handcrafted, faux-painted copper cooktop chimney. In the summer, we live in the screen porch (14’ x 24’), where we have a wood burning fireplace and a picture-framed cedar floor. 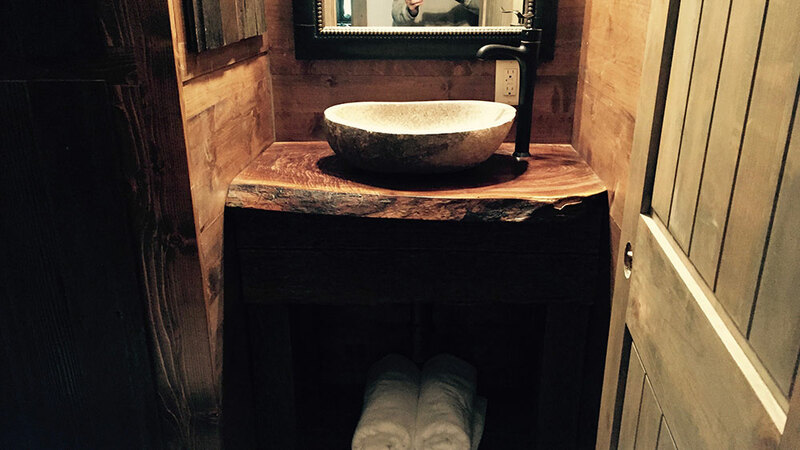 We enjoy finding antique outboard motors and putting them to use in creative ways. On the gable wall in the screen porch we have fabricated the back end of a boat appearing to be crashing through the wall. 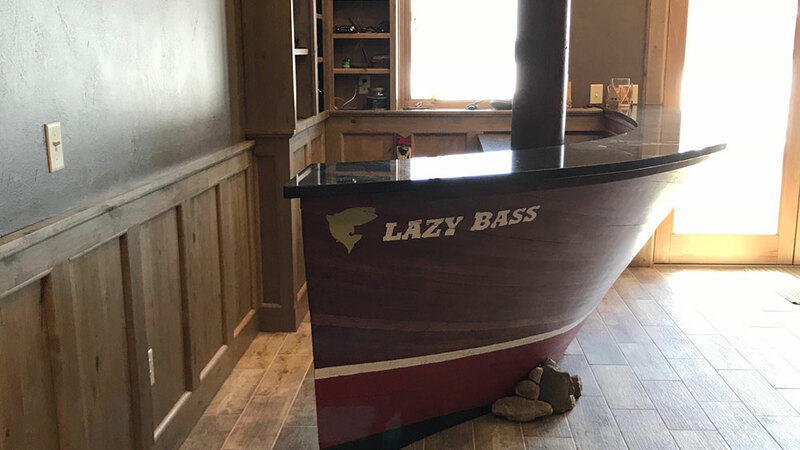 The boat theme continues in the basement where we built a bar in the shape of a boat, “The Lazy Bass”. We went to great efforts to make this look like a boat, even spending time on YouTube watching how real wooden boats are crafted. 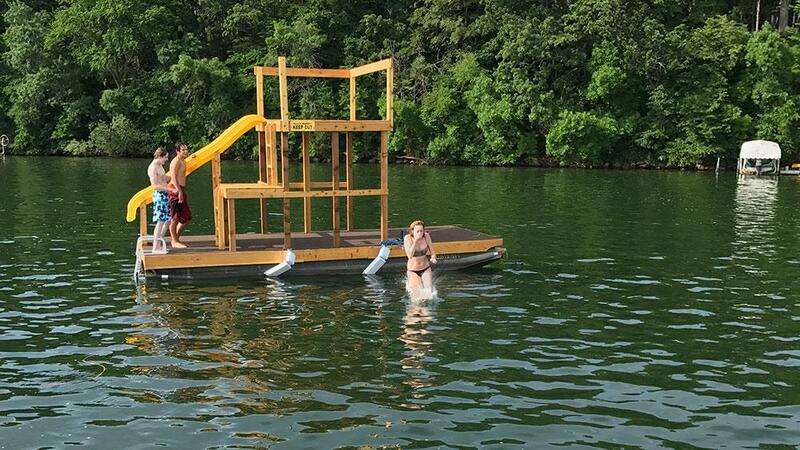 What we enjoy most about the lake is family. Having David, Doreen and their boys, Matthew and Nathan, right next door is a blast. Our kids, Natalie, Alison and Aaron have grown up with their cousins at the lake. We also enjoy company. We have plenty of room to host with a separate guest quarters over the garage we call “The Rookery”. It overlooks the towering pine forest where Great Blue Herons nest every spring. 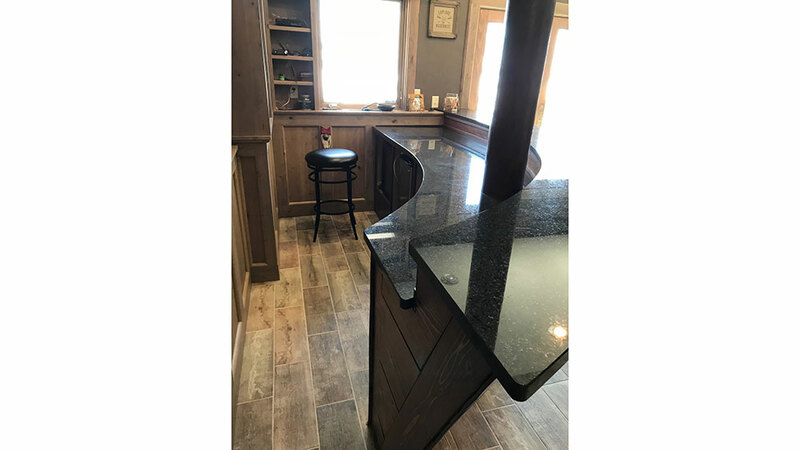 The guest cabin (Fox Den) also has two bedrooms, bathroom and full kitchen. Dave and Doreen are also building a guest cottage. They call it the “Horseshoe Chalet” as it is adjacent to the Horseshoe pits. Of course, it is all about being outside and enjoying the beautiful scenery. 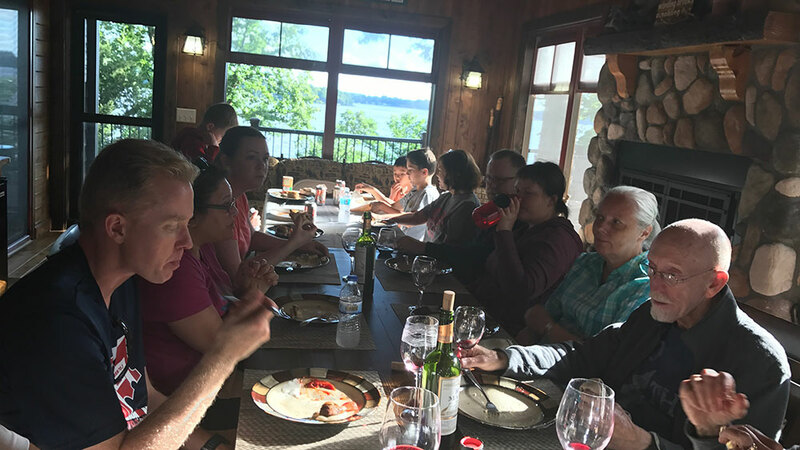 When we are not on the lake boating or fishing, we enjoy “happy hour” on the lower level patio looking out at the lake, or sitting on the deck of the lookout tower where you are about 70 feet above lake level. At night we head to the screen porch for a campfire and our traditional guitar sing-a-long.